One of the best offensive linemen to be produced during this period, George Kunz was an All American at Notre Dame before being drafted with the second overall pick of the 1969 draft. Co-captain of the 1968 Irish team, Kunz struggled through injuries his first two years for the Golden Domers, before finally finding him niche on the offensive line at Tackle. He quickly established himself in the upper echelon of linemen in the NFL, playing for the Falcons from 1969-1974. After the 1974 season, George was traded with a draft choice to the Baltimore Colts for 2 picks in the 1975 draft. 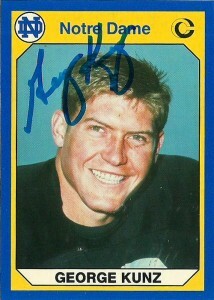 He amassed 5 AP selections and appeared in 6 Pro Bowls for the Falcons. 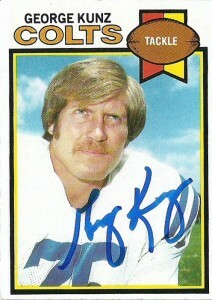 He continued earning Pro Bowl and All Pro nominations with the Colts, from 1975-1977. A back injury limited his playing time to only 1 game in 1978 and 1979, but he returned for one final season in 1980 before he finally retired. Over 11 seasons in the NFL George Kunz appeared in 129 games. Based in part because Kunz played for some very, very bad Falcons teams, along with guys like Tommy Nobis, he’s been largely ignored by the NFL HoF selection committee. It also doesn’t help that he played at the unglamorous position of offensive tackle. George has lived in Nevada for quite a few years since retirement from the limelight, dabbling briefly in coaching and color commentary for NBC. He is an avid TTM signer and boasts a remarkable response rate for the amount of cards he signs.